Product #21968 | SKU ADI4DD | 0.0 (no ratings yet) Thanks for your rating! 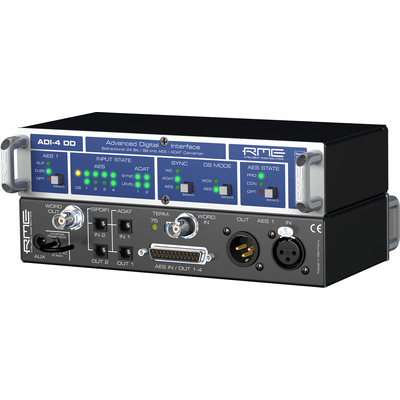 RME's ADI-4 DD is a highly cost-efficient AES to ADAT and ADAT to AES converter. The device basically consists of two convertors - four AES-3 inputs (eight-channels) to double ADAT outputs and double ADAT inputs to four AES-3 outputs. Features include support for up to 96 kHz sample rate and built-in jitter suppression. The double ADAT ports enable full eight channel support from 32 kHz up to 96 kHz (S/MUX). The actual state of the incoming and outgoing signals and ongoing operations within the unit are easily monitored via multiple, clear LEDs. SyncCheck not only shows if an input signal is locked, but also if multiple inputs are in synchronous lock. Furthermore SyncAlign technology prevents accidental errors of +/- single-sample misalignment between the AES/EBU inputs. The unit displays highly efficient jitter suppression that enables it to refresh and clean up any clock signal, and to provide the clock signal as reference clock at the word clock output. Additionally, Intelligent Clock Control (ICC) will maintain the last sample rate detected as valid, in case of fault and loss of input signal. The ADI-4 DD is housed in a compact single height, half-rack space enclosure. Dimensions (WxDxH) 8 1/2" x 4" x 1 3/4"